The Ministry of Transport and Infrastructural Development, (Central Vehicle Registry and Zimbabwe National Road Administration) would like to inform the motoring public that all vehicles that have not been licensed for a period of two years will be automatically de-registered from the CVR Database. The Registrar put out an advert in today's daily newspaper. Said the Registrar, "IT is hereby notified, in terms of section 12 (c) of the Vehicle Registration and Licensing Act [Chapter 13:14], that the Registrar intends to cancel the registration of vehicles not licensed or exempted for a period of two or more years as at 31st July 2018. 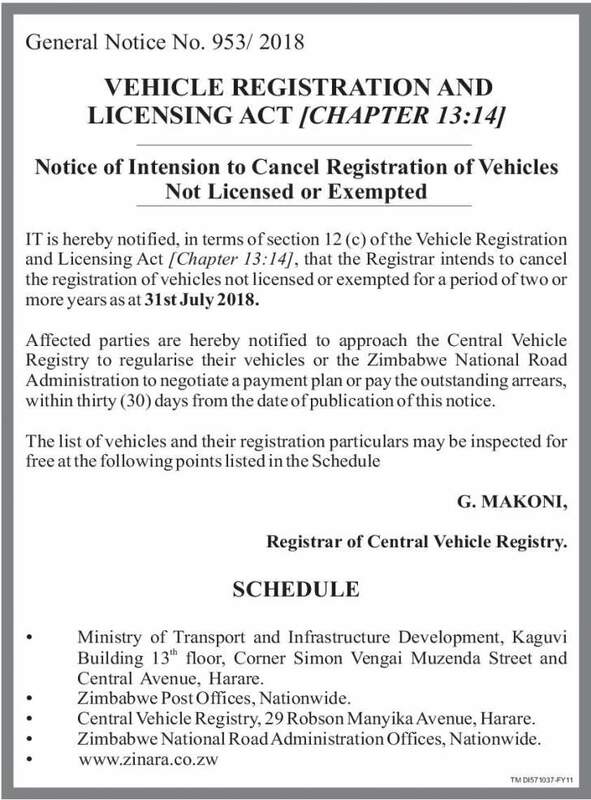 "Affected parties are hereby notified to approach the Central Vehicle Registry to regularise their vehicles or the Zimbabwe National Road Administration to negotiate a payment plan or pay the outstanding arrears, within thirty (30) days from the date of publication of this notice. "The list of vehicles and their registration particulars may be inspected for free at the following points listed in the Schedule."